I busted in 66th place, 63rd place paid £410 with 21 K for first. 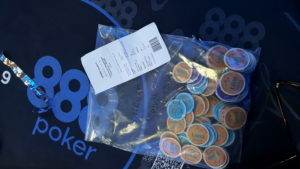 I came back for day 2 with 82 runners and 63 getting paid with an average stack. 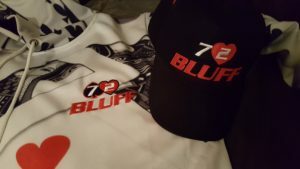 In the big blind with blinds 2,500/5,000/500 ante 12,000 I call a raise with to 12K from mid-position with 53o and hit a flop of 3 10 J two diamonds, I check initial raiser makes it 21K I re-raise to 45K and he puts me all in. I fold and he shows me 44, “Bluffing with the best hand” I tell him. Next hand I pick up AQ and facing a mid position raise of 12K and a call of 12K from the button I ship 112K and get two folds, button had a small pair it seems. I limp 910 clubs from button and get a call and a raise to 16K from BB which I call in position, a flop of J 9 6 gave me a 2nd pair. 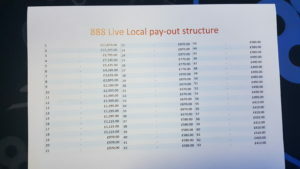 BB bets 19,500 and I call, turn is a 7 and BB checks. I raise 25K hoping to charge a flush draw and he calls, river is an 8 giving me the straight. BB checks and I bottle betting, backdoor flush got there and I was worried about Q10. I tank and just call and BB shows KK, I’m furious at myself for being so lame I have to value bet there, awful play but up to 212K. I raise K6 13K and get re-raised by BB to 26K and I call in position, flop comes J 10 4 two diamonds and one heart. BB leads for 21K and I make it 60K to go and he puts me all in and shows me one Jack. This is poor play I should have folded pre-flop,I dusted off 85K with K6s, let the game come to you, stupid play. Then the killer hand early position limp SB complete and I check in the BB with Q9 clubs. Flop comes A93 two clubs. I’d promised myself I wouldn’t go bust before the bubble and found myself with 2nd pair and a flush draw aghhhh…two days in a row. SB checks, I check and EP makes it 12K pot is now 32,500 and I jam 130K and get called by A7, turn is an ace and river a blank and I’m done. Villain had a stack to call and one club so I had 11 outs when called for approx 40%. I should have called the flop and re-valuated, not sure how I would have dealt with the ace on the turn when he would have no doubt bet. Upside I add 30K to my stack, downside I lose £410 ICM suicide. Near the bubble I could have just folded or taken the correct less risk approach of calling and then re-evaluating on the turn. Awful, awful, awful.. Villain below took my chips…will let you know where he finishes, pretty sure I did a similar thing to him in a previous tournament when he couldn’t believe I really had the goods. 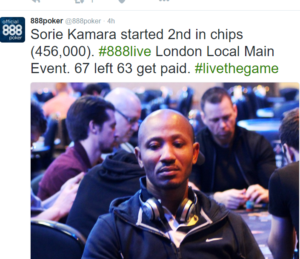 He was 2nd in chips before he took mine…Sorie Kamara came 9th for £2,1890, three players from my table made the final nine. Gladys Long came 5th for £5,435 and Ciprian Teaca 3rd for £9,795.